All Mckenzie Bridge homes currently listed for sale in Mckenzie Bridge as of 04/23/2019 are shown below. You can change the search criteria at any time by pressing the 'Change Search' button below. If you have any questions or you would like more information about any Mckenzie Bridge homes for sale or other Mckenzie Bridge real estate, please contact us and one of our knowledgeable Mckenzie Bridge REALTORS® would be pleased to assist you. "Elegance brought from the outside to the inside of this lodge style custom built home on the beautiful McKenzie River. Lush greenery & accessible river frontage. Solid maple & hickory cabinets, stone fireplace, granite, stainless steel appliances, marble & clear cedar decor. Luxurious master suite. Spacious deck & gazebo for relaxing. 50x60 shop/RV garage & generator. Not your typical summer cabin...elegance in the woods on the river." 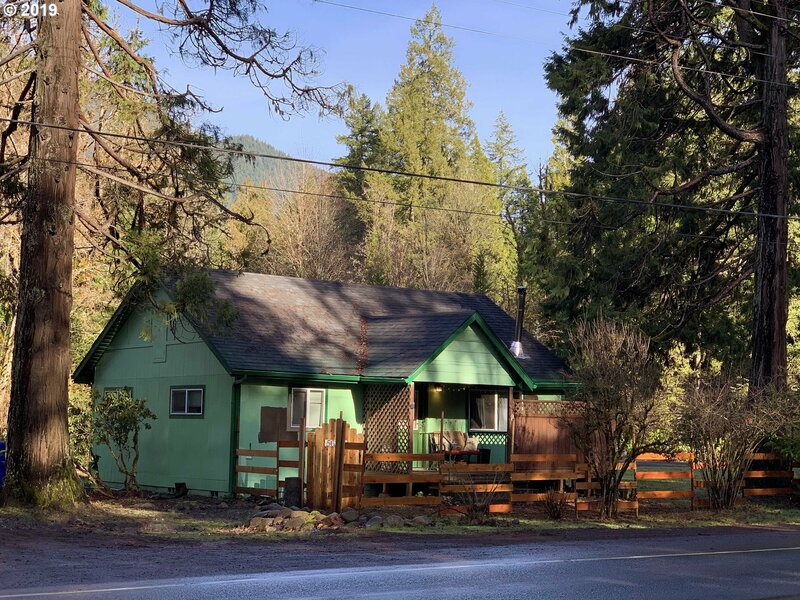 "Located in the heart of McKenzie River recreation. Secluded 3 acres of evergreen trees. Orig. Rustic Bdrm/Studio & Kitchen w/cozy loft, gas range/oven. 3-4 bedrooms. 2-story Homestead w/solid wood/brass details, lead-glass window, nooks, built-ins. Out-bldgs storage/studio/shop. Add'l Bedrm in Guest house w/private deck-Air B&B. Local Hub w/restaurants, groceries, espresso/bar/dining. Hike, golf, fish, Mt bike & more." "Amazing opportunity to live among the trees! Single level home with fireplace is situated on over an acre of level and usable land. Features an attached garage, large covered deck, mature landscaping and multiple outbuildings including a large shop/RV garage. Situated close to multiple hiking trails, fishing, mountain biking, golfing and hot springs. Why not live where others only vacation?" "Log Cabin Condominium complex is situated on 7 acres on the bank of the pristine McKenzie River. This charming 1 bedroom and 2 bathroom cabin features quality construction, gas fireplace, sleeping cove and a detached one car garage. A large screened porch is not included in the square ft., but it is the ideal spot to enjoy the river sights and sounds! Home is being sold fully furnished." 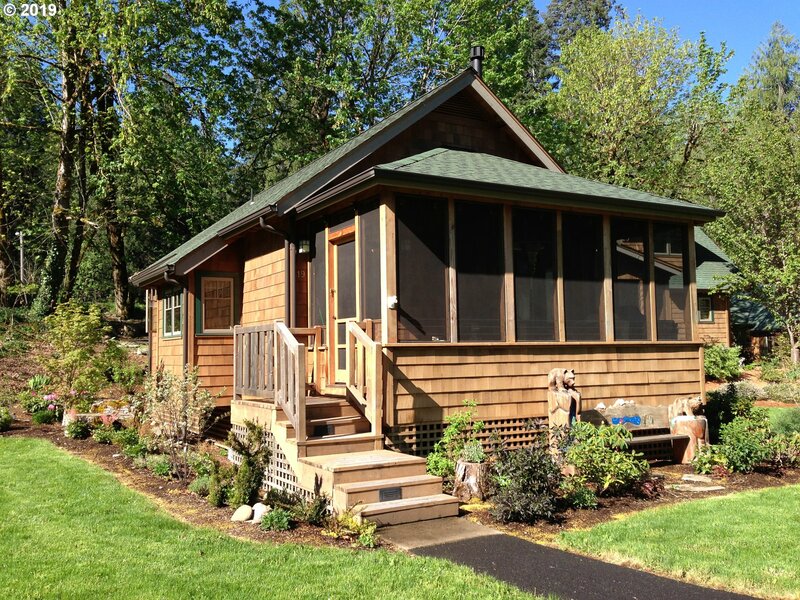 "Great 1st-time home, cabin, VRBO in the heart of McKenzie River recreation. Updates: New roof, light fixtures, wood burning stove, kitchen floor, bathroom sink, hot water tank, new kitchen sink/faucet... Room to add on, privacy fence under construction-sold as-is. 1.06 acres. 2car/garage/shop. McKenzie Bridge hub for outdoor enthusiasts, casual dining, bar, entertainment, groceries, espresso. Seller to Credit Buyer $1,500 for ext paint"